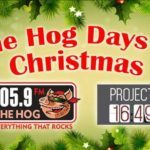 The Hog 105.9 FM is bringing some holiday cheer to Project 16:49. Join The Hog on location for your chance to donate and win thousands of dollars in prizes! When you make a donation of money or needed supplies, you’ll receive raffle tickets and a chance to win a gift from under the Hog’s Christmas tree. Learn more at the The Hog 105.9 FM website!